BDCW ULTIMATE Skid Plates continue to be the top choice for expert riders, proving its worth in the most rigorous conditions and terrain worldwide. Think you don’t need this much protection? Think again. It’s while learning to master big bike skills, both on pavement and off-road, that carnage happens. Rocks get kicked up, bikes get dropped and hung up, curbs get in the way, and scrapes and spills are just part of the adventure. And the ULTIMATE Skid Plate is designed to take all of the abuse—and more. NOTE: Because our design relocates the side stand OFF the engine, the Side Stand switch must be disabled. We include the necessary parts to accomplish this—no additional parts required. 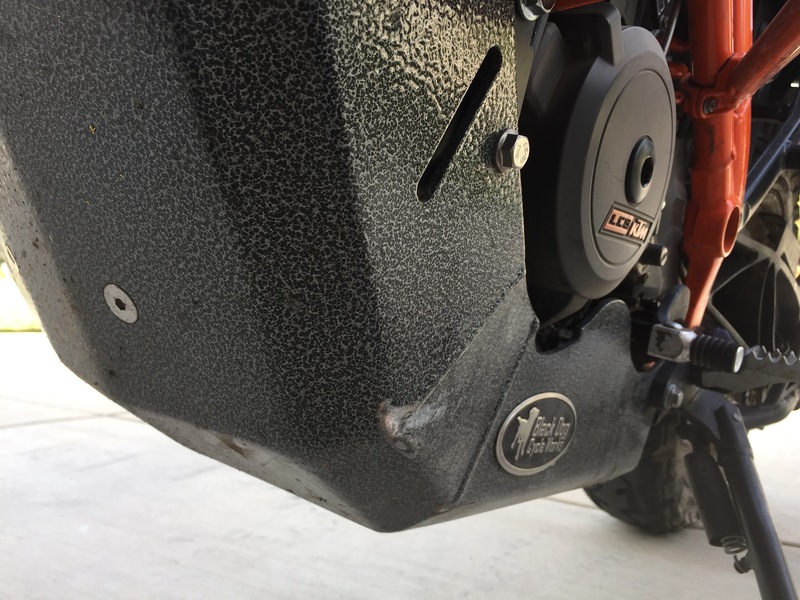 ENGINE GUARDS—The installation of our skid plate requires stock KTM crash bars (all models)or the SWMotech Crash Bars (SKU: SBL.04.873.10000). Does not work with other aftermarket crash bars. If you select the "No Center Stand" version, our design does allow for the addition of a center stand at a later date by simply removing the spacers that fill the spacer where the center stand normally attaches to the frame. If you are not currently using a center stand you MUST order and install the spacers until you install the center stand, otherwise you could damage the attachment points on the frame. Here at Black Dog Cycle Works we try not to “rest on our laurels”, so when KTM released the new 1090R and 1290R with increased off-road capabilities, we decided to take another hard look at our skid plate for the 1090/1190/1290 models to determine if we could make improvements. And we did, with the Ultimate Skid Plate 3.0 with integrated Side Stand Relocation! While maintaining maximum protection of critical components we were able to refine the design creating a sleek lower profile with increased ground clearance, improved airflow and reduced weight. The number one priority from the beginning with our skid plate design for these bikes was to relocate the vulnerable side stand OFF the ENGINE CASE! Given our first hand experience with the 950/990 side stand design, we were baffled when the new KTM design for the side stand on the 1190/1290 is actually MORE susceptible to damage to the engine than the previous 950/990 models. Our comprehensive skid plate design is actually two products in one—a rugged skid plate PLUS a patented side stand relocation kit. Others may tell you that removing the side stand off the engine is “not necessary” because their skid plate “provides coverage”—if you are willing to gamble an $8,000 repair bill and getting stranded in the backcountry, that decision is entirely up to you. Click here for a comprehensive explanation of the side stand issue on these bikes. Larger dimensions and stouter construction means your $8,000+ engine has max protection. Plus, it fully protects the clutch, ignition cover, header pipes and catalytic converter—most other brands don’t. Many riders don’t realize a replacement header pipe alone costs $1800 (+ labor). We have removed the kick stand from the engine case, eliminating the risk of a broken engine case from an impact to the side stand! PATENT# US D729128. We have created three mounting points on the frame at the center stand mount, greatly increasing the strength of the rear attachment points while keeping the mounts OFF the engine case. You get what you pay for. And we found the optimal material to protect, perform, and last. In fact, it could outlive your bike. The grade of aluminum we selected is designed to ABSORB impacts, not transfer the force to the mounting points on the bike. Attaches to the frame—NOT the engine. Saves your engine case from potential damage. No holes to snag on rocks or branches. 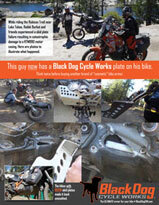 This plate glides on its own˜right up over most obstacles without bolts, rubber sliders or rivets to catch or break. Eliminates the need for an extra center stand bash plate. Remove just 4 bolts for an oil change / maintenance! Not that it matters when it’s covered in mud. Considering the costs of expensive repairs or “extractions” from the backcountry, it’s a bargain! More great feedback from Black Dog fan, Mufaddal Alaithan. "Hey, my KTM 1190 skid plate came in today!! Awesome piece! Thanks again and foot pegs are next! I recently purchased the skid/relocate combo from BDCW for my 17 1090. Yes it's expensive but it will make sense when you actually get to hold it and see how much effort went into engineering and manufacturing this kit. Kurt was very helpful and replied quickly via email. Awesome product and awesome service. Skid Plate and side stand relocate. The quality of this product is top notch I am very impressed. I was hesitant at the price at first but making the bottom of my new KTM 1090 like a M-1 tank priceless. The assurance that my side stand is off the motor and will not leave me stranded or worse is great.